Here we see what God has done for us. This is our new identity. This is where our being is solidified in Christ. This is our mold where we are conformed. 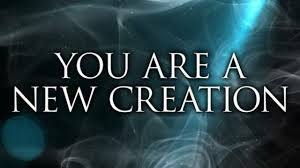 We are new creations in Christ Jesus! Our old nature, that sinful, fleshly, Adamic nature has been crucified with Jesus on the cross. The word crucified here means to crucify along with. We have been methistēmi, transferred, or transposed and removed from one place to another. (Col 1:13) Jesus has paid for our transfer. (1 Cor. 7:23) We are no longer bound to sin. Once our identity is solidified with this truth we can no longer be conformed to this world and will no longer be under its influence. We are dead to sin and must reckon ourselves so. (Rom. 6:11) The word “reckon” in Greek is logizomai. This means to reckon, count, compute, and calculate. It’s a mathematical term. Two plus two “reckoned” is four. Our old nature plus crucified along with Christ “reckoned” is dead to sin and alive to God in Christ Jesus. Oh the glorious destruction of sin and our sin nature! We are no longer bound and inhibited by this first heaven life! We are seated together with Christ in heavenly places. Together is Greek is sygkathizō which means – to cause to sit down together, place together. Co-heirs! When I think of our identity and placement in Christ, I can’t help but think of Esther 5:3. Esther found favor with King Ahasuerus and he offered her up to half the kingdom. Not saying God gives us up to half of His kingdom but He does give us His Kingdom and we are seated together with Him. I think of Matt. 5:3,10 and Matt 11:11, Luke 7:28. Among those born of woman there has not been one greater than John the Baptist. In other words John the Baptist was the man, he was the one who prepared the way for Jesus…and Matt 11:11 and Luke 7:28 both so the least in the kingdom of heaven is greater than John the Baptist. We are greater than Adam, Enoch, Moses, Abraham, Isaac, Jacob/Israel, Elijah, Elisha, Ezekiel, Daniel, King David, Solomon, Jeremiah, Joseph, etc. Those least in the kingdom are greater than all these Old Testament Godly men. This is our identity! This is the new creation, the Kainos Ktisis. We are a new breed, species, creature, and creation that has never existed on earth before Christ’s resurrection. Identity comes from what God says about you regardless of profession, gender, calling, background, and upbringing. He calls you blessed! He calls you sons and not slaves. Your heart is good and no longer evil and stone. You have a new spirit, bound to the goodness of God. All of our identity is in Christ, the firstborn of many sons. We are included in the Father, Son, and Holy Spirit’s relationship and even partakers of His Divine Nature. And with this truth our identity is solidified being conformed (having the same form) to the image of Christ so that the world’s mold will never be able to conform us again. We are saints and no longer sinners! I believe we are sinners, but repentant sinners. Sin is rebellion to Yahweh’s laws and commands: in other words; His will. He gave us His Son to enter into the covenant of obedience through His sacrifice. He gave us the written word to teach us what righteousness is and how to transform from a sinner to saint. Turn back to Yahweh’s righteousness in prayer for understanding. Be baptized in the saving name of Yahshua for the remission of sins and the promised power through the Holy spirit. Are you commenting to say I should turn back to Yahweh’s righteousness and that I need to be baptized? Or are you saying in general to everyone? The Scriptures, graphe, describe believers as saints and no longer sinners. Both. Yahshua’s name is essential to salvation. Our bibles translators admit to removing Yahweh’s name in keeping the tradition of the Jews which claim and teach that His name is too Holy to be uttered by anyone but the Holy of Holys. Yahshua’s name means Yah’s salvation, and it too had been removed over this man-made tradition. There is only one name under heaven that will be saved from. And only one name that holds all authority given to it from on high. Thank you for these words dear. God will continue to use you to grow and increase us. Thank you also, for following my blog, I hope to see more of you and your comments. Thank you. Good stuff, you are off to a great start! Also,thanks for stopping by my blog. Since Hebrew/Aramaic was Paul’s native language as he didn’t have a Greek education but likely picked up, “street Greek,” I always try to think of what he might have been saying in Hebrew. If we move the words, “new creation,” into Hebrew, the meaning is that of a shaping by cutting as a sculptor, fashioning, forming, molding along with making full and complete, as an artist might build a painting from a sketch. The word for new is the same root as the word for month, and as we mark the cycles of the moon, and although the moon appears to change, we know it doesn’t, but our vantage point changes its appearance. The heavenly point of view is full, while ours is changing and partial. This subject is something that should be reviewed a lot. We can so easily forget who we are, and whose we are. We must rehearse these truths in order to stand when trials and tests come along. If we keep these truths in front of our eyes, we will remain victorious and not defeated.